Friday afternoon usually for me is the end of my blog and design work week. I usually wave the white flag and pack it in at this point. This particular Friday, I got one of the nicest deliveries from my UPS man, that I ever could get. I am not kidding when I say I was never so happy to open up a box and see a perfectly beautiful wine label staring me in the face. 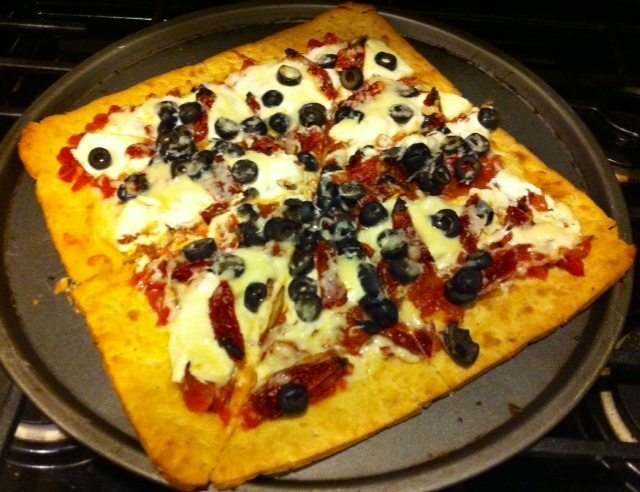 It worked out perfectly, for not only was I in need of a glass of wine, but I was also making my homemade stone flat pizza with dice tomatoes, sun-dried tomatoes, fresh mozzarella, goat cheese and black olives, too. This wine is said to be perfect on its own or paired with food. And I was told by Anew Riesling could be tried with spicy Asian dishes, smoked salmon, lobster salad, pasta with light sauces and blue cheese. I figured why not try it with Friday night pizza! And yes, Anew Riesling offered just the right amount of bright fruit, subtle spice and citrus with a harmonious blend of pure fruit flavor, heightened aromatics and balanced acidity. I even could taste the fresh peach (one of my favorite fruits), as well as a hint of spice that gave this wine a crisp, refreshing essence. 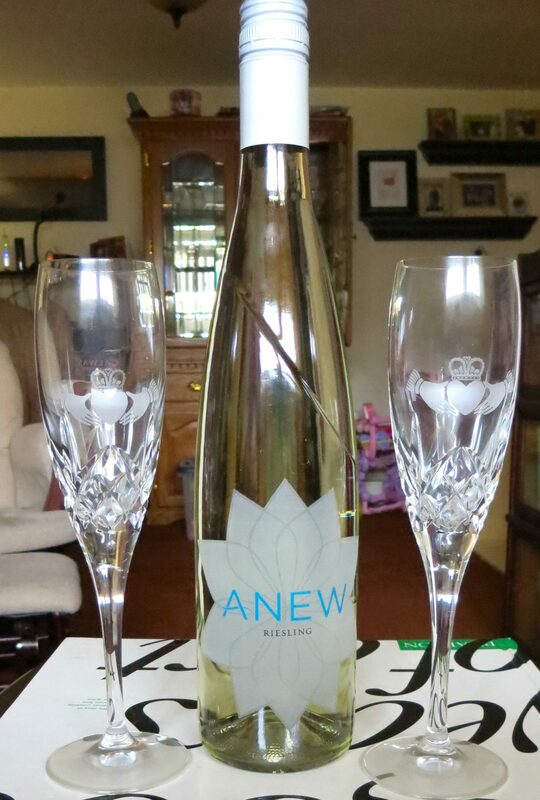 Anew Wine & Claddagh Glasses – Serving the Wine Up in Style Tonight with Our Wedding Flutes! Simple put it was perfect and didn’t miss a beat for me and was truly a nice balance of medium dry/sweet that was promised to me by Anew Riesling. So, huge thank you to Anew Riesling for letting me try their lovely fruit wine with my Friday night meal. 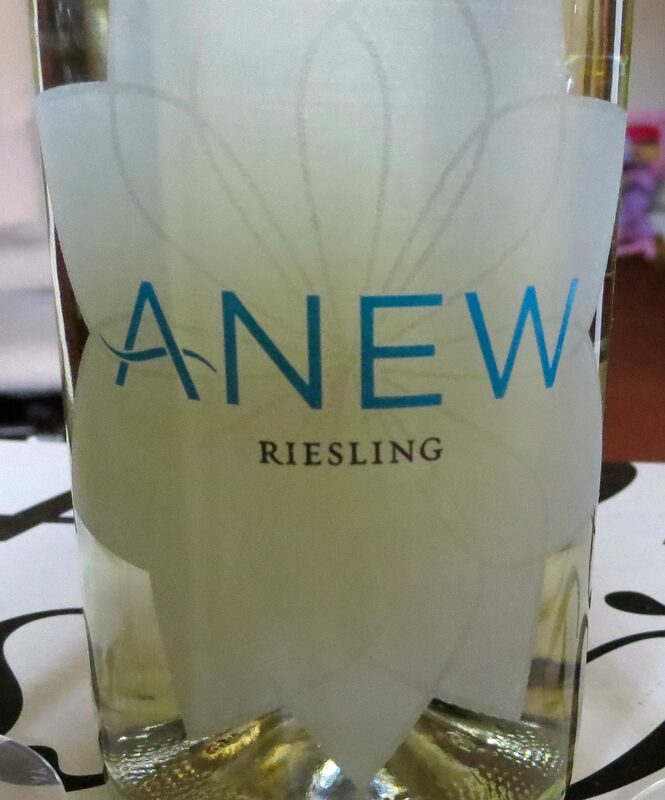 To find out more from Anew Riesling and to connect with them on Facebook, click here. You don;t have to ask me twice to try out a new wine. I am ALL over it, my friend. Love Riesling, love pizza… sure would have loved to have been at your place the other night! Looks like a great wine. I wish I had gotten in on that review too! 🙂 I am alll about trying some wine! My recent post Do you know a Scary Mommy? Even though I like to drink wine sometiems, I have no idea about different types, flavors, or distinctions of wine -which annoys my hubby. Though I do LOVE a sangria udirng the summer. Lately I am a big fan of beer. Now this would've been a review I would've love to participate in. My inner wino is intrigued. Friday night is also our traditional pizza night and now I really can't wait for the weekend. Are those olives on your pizza? I used to hate them, but now love them on pizza. Especially with feta and sundried tomatoes…. mmmm! 🙂 Hope you're having a great Wednesday – all downhill to the weekend from here, yay! My recent post When did “maid” become a bad word? The bottle is really pretty. I'm more of a red wine kind of gal, but this sounds like it'd be great on a nice, warm summer night. Very nice gift. Hooray for you, Janine. Have a great day doing your thing, my friend. Is it crazy that I'm not a wine drinker…..
Not crazy and know plenty who aren't. And as I said below, I love Sangria, too!! 🙂 xoxo!! I didn't know it had a peachy taste to it! Now I'm even more excited to try it!! My recent post House Rules…Lieber Style! Reisling is my mom's favorite! I will have to tell her about this one. So glad you got to spice things up a bit. That homemade pizza looks pretty tasty too! Hmm. I'm not a big wine drinker, but if I do have a glass it's white wine. I will have to remember our lovely sponsor the next time I need to bring a bottle as a hostess gift! The wine really was yummy and that pizza looks delicious! Hmmmmm . . . now I'm hungry & thirsty! My recent post Tuesday Ten – What's In My Car? I will drink Dana's wine!!! I feel sure that everyone knows by now – I do love a glass of wine in the evening!! I'm going to have to try this one since it is new to me! My recent post Wordless Wednesday – Surprise! The only thing better than a wine delivery on a Friday, is probably a wine delivery on a Monday. That's when I'd need one! It looks so refreshing. I love that you researched food pairings. My recent post Winter’s Leftovers. You're so awesome Janine. Because good wine is good wine and good wine goes with every food (or no food). Also? Your pizza looks amazing!!!! My recent post Be Happy, Eat Chocolate! Good wine is wonderful anytime! Sounds like a lovely Friday night! Sounds good I don't normally like Reisling, but I may try this one. Great review! I really loved this wine, and I'm looking forward to sharing it with my readers! Lovely idea…pizza and wine! Thanks for sharing on the Thursday blog hop. My recent post 5 Important Steps for Youthful Skin….Plus the Thursday Blog Hop! My recent post The Best Giveaway for Moms! That pizza looks really good and I cannot wait to try the wine myself. I always thought riesling needed lighter fare – glad to know that's not the case.